Are Self-Limiting Beliefs Undermining Your Sense of Worthiness? Last year, I bought Neurogym’s Winning the Game of Money program and listened to the 12 weeks worth of audios dutifully not once but three times. Still, I hadn’t really made the progress with my business I’d have liked, nor had I broken through some of the barriers to my success. I finally set the program and all of its bonus materials aside for awhile, and focused on my physical health with much more success. I’ve learned over the years that if something isn’t working or I’m just not getting it to set it aside and let the ideas percolate for a while. In fact, I’ve found that works for books I can’t, at first get into as well. (Most notable lately was Eckhart Tolle’s The Power of Now.) When the time is right, I’ll have an epiphany and be able to resume forward progress (or in the case of books, I might get bonked on the head when what I need to read falls off the shelf in protest for being ignored). This week, I had one of those epiphanies. My business block had to do with a self-limiting belief about money, or more specifically, people with money. Somehow, I’d gotten it into my head that I wasn’t worthy of associating with people who were, by my perception, rich, or at least very well off. I know it’s silly as people are people regardless of their net worth, but the feeling was there and I needed to find its source and clear it. I didn’t have far to look. My mom was very conscious of money and people who had it. Most of my life she was trying to align herself with wealthy people, but anyone who knew her as well as anyone was allowed could see she wasn’t entirely comfortable around even those she called friends. Admittedly, my mom had more unworthiness issues than anyone else I know, but love and money were her biggest albatrosses. We inherit many of our traits and beliefs from our parents whether we like it or not. Many just bubble beneath the surface, harming no one. But others, like feelings of unworthiness are diabolical creatures. They undermine our best efforts to follow our dreams; telling us in the most sincere, loving voices that we’d best turn our attention elsewhere. Like a rattlesnake hiding in the grass waiting to bite the unwary, our internal nay-sayer lies in wait for opportunities to chop us down to a size it deems appropriate. Why? Because change is our internal voice’s mortal enemy. Many times, we don’t even hear the whispered voice telling us we can’t. We simply fail one time too often and give up, often just before the attempt which would have yielded the results we sought. We can silence the voice, but first, we have to recognize its existence and more, its methods. In my case, that voice was particularly annoyed because I’d recently replaced It’s too hard! with I can! with regard to physical activities. I’ve been pushing my limits at the gym, and more recently, on hiking trails, with spectacular results. That voice was especially determined to knock me down to size, and where better than my dreams of being a successful writer and entrepreneur? Lessons Are Like Dancing. What Works in One Area of Life Will Likely Work in Another. But I’d learned a valuable lesson with my physical improvements. If I tell myself I can and keep trying no matter how many times I fail or have to take a step back, I’ll eventually conquer the next milestone and be able to move forward. I also started looking around at my circle of friends. Most of them, admittedly, are from the dance community, but that makes more sense as I join some of them for hikes or other activities which involve self-improvement. People who engage in an activity like dancing on a regular basis are the last ones you’ll find sitting on a couch at night munching on junk food and drinking beer. In short, the antithesis of the people my ex attracted. I’ve come a long way from that place, though until now, I hadn’t realized just how far. People who have already eschewed the pull of the one-eyed monster and couch surfing are the ones who are more likely to challenge themselves in all areas of their lives. They’re the people who retire only to start new businesses or take on large projects. They’re the ones you can count on for help if you’ve bitten off more than you can chew, or just need an example to follow to get you past a temporary road block. Often, they’re the same ones who are financially well off, but are also low-key about it. So when I noticed how many of my friends are traveling at least once a year to Europe or South America or other exotic locales, it hit me. I already do fit in with those who are better off financially than me. And nobody cares! They simply accept that I’m at a different place in my life. I’ve made choices which temporarily put me at a lower point economically, but as that isn’t the basis of our friendship in the first place, it just isn’t an issue. If it’s not an issue for my friends, why on earth should I make it one in my own head? When it comes to self-limiting beliefs, the first step is to recognize them. The second is realizing the only one they matter to is ourselves. At that point, we can use whatever method works for us to release the belief. In some cases, it might be writing it on a piece of paper and burning it. In others, perhaps meditating on releasing the baseless and inhibiting belief. Still others might just bulldog their way through, faking it ’til they make it, as it were. I tend to use a combination of techniques, but have added a new one this time and hired a business coach. We’re only really focusing on one area where I’m stuck and I’ve only purchased three sessions, but it will get me headed in the right direction. And I will also be ready to listen to the Winning the Game of Money audios as well as working through the tasks with more clarity and direction. Two of my biggest road blocks are now out in the open where they can be addressed and released. I’ve learned already that I truly do have tenacity in far greater quantities than I gave myself credit for. Now I’m learning how I’ve been getting in my own way regarding money and social status. There will be more discoveries and releasing to do along the way, but these unexpected successes will make it easier to negotiate the mine field of my own mind in the future. I’ll be more inclined to get out of my own way and ignore the voice telling me I’m not good enough or intelligent enough or determined enough…any enoughs at all. 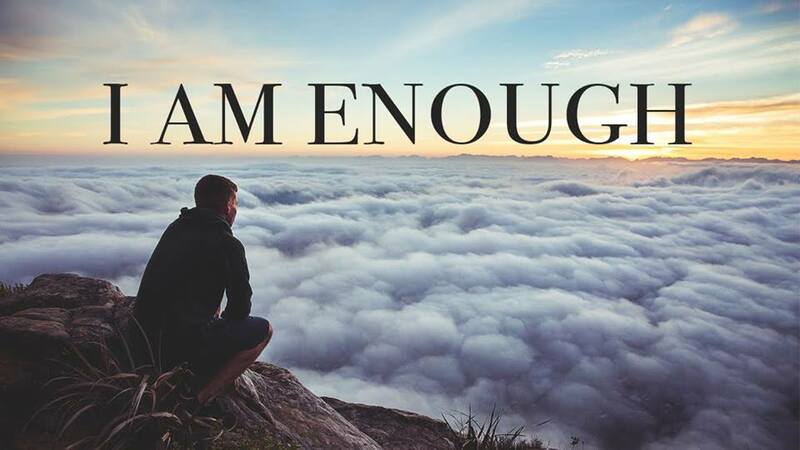 Because at the end of the day, what truly matters is that I am enough! What is holding you back from achieving your dreams? What self-limiting falsehoods is your inner voice feeding you so it can avoid having to change? How are you going to clear those thoughts and replace them with the ones which will propel you in the direction you want to go? There’s never a better time than now to start shutting those who would get in your way down. And the worst of those will always be the ones inside your own mind. I’m grateful for the excellent examples my friends and family set for me. I’m grateful for learning to release self-limiting beliefs. I’m grateful for the skills and abilities I uncover as I stop letting my change-reluctant brain get in the way. I’m grateful for abundance; energy, strength, inspiration, friendship, joy, success, motivation, encouragement, self-improvement, dream manifestation, health, happiness, peace, harmony, philanthropy, and prosperity.